Hola :) How are all of my peeps today??? Good Monday? Do anything fun??? Mine started out at 7 something when my alarm went off. I read my scriptures, then re-set it for later. hehe. And went back to sleep. And woke up, said my prayers, and hurried out to get Eme ready for Volleyball camp! Jake and Tom and Joe were already awake, and were having breakfast. Eme's alarm hadn't gone off, so she was a bit rushed, but managed to get ready on time. We loaded up in the car, and she and I headed up to the Main Post Youth Center where the camp is. And saw Charlotte in the parking lot! Her 12 year old, Maddie, is in the camp too!!! I took the girls inside, and got them situated, and headed home. But decided to swing by the commissary first, and get some milk and a few other needed items. I pulled in the parking lot, and realized that I'd grabbed my pool bag. It had my military ID and my drivers license. But no $$$. Crap. So I drove home. And decided to go to Walmart. Joe and Jim both wanted to go, so they got ready. I told Jake and Tom that once chores were done, that they could have free time. So they were cleaning when we left. We got to the "Jaurez" Walmart, got my favorite parking place (yeah! ), and headed inside. And noticed a sign near the bakery that said "Free Cookie". So we asked about it, and the chickie was like, put your sticker here. Eh? What sticker? She was like, Didn't the greeter give you a sticker? Um, no. So we went back and asked for a sticker. He didn't seem like he wanted to give us one! But he did, and we went back to the bakery. We gave the bakery chickie the stickers, the kids got the cookie, and off we went to shop. I had a list, and mostly stuck to it. Mostly. hehe. A few things ended up in there that we didn't need, but mostly just necessities. We paid, and headed home. And I realized that I like shopping by myself better than with children. hehe. They'd talked me into buying new pillows for everyone, and Joe and Jim were totally having pillow wars all the way to the car. Sigh. We got home, put our groceries away, and had some free time. The house was mostly clean, so I sat down to watch an episode of 24. And design a bit more. I think I got 2 WordArt packs done. At noon, we loaded up in the truck, and headed to the Youth Center to get Eme. And have lunch. Then head to the pool. Charlotte texted this picture of Eme and Maddie to me. Aren't they cute!!! And we headed to the pool. Joe had packed Eme a swimsuit and a towel (sweet boy), and we caught up with Terra. Her twins were in daycare, and she'd brought her 12 year old and her 15 year old sister with her. Terra wasn't swimming, and was sitting in the shade, so I went to sit with her. We hung and chatted and had a grand time :) I did go down the slide at one point to cool off. It's hot in the summer time in El Paso, you know! hehe. Margot and Emma came a bit later, and chatted and played. Everyone seemed to have fun. We headed home around 2pm, I think. We got home, and had some free time. I tried to watch some 24, but I fell asleep. ha! And had a nice nap. I woke up around 4:30ish, and cooked some Manwiches for the kids for dinner. Then I went and took a shower. Amazing, I know! The girls and I were gonna go to a movie! Terra had seen Something Borrowed when it first came out, and LOVED it. So we'd decided to go and see it when it came to the $2.00 theater. And tonight was the night. ha! Here's me in the car, on the way to Terra's house. I'd left Jake and Tom in charge, and gave them all the directions they needed for the evening. Margot and I got to Terra's house around the same time, and went in. Emma was gonna stay with the girls. My twin was SO happy to see me. hehe. I wanted to take a pic of her, but she was totally picking her nose! hehe. So I took one with me picking my nose too! ROFL! And so did Eryn! There ya go, Kendra. Now you won't feel embarrassed - ha! Terra had bought some of the White Cheddar popcorn seasoning a while back, and hated it. Whaaaat? Its the best stuff EVER. So she gave it to me. See how happy I am? hehe. Margot and Terra and I drove on over to Montwood movie theater, got our tickets and popcorn, and sat down for the movie. Kari came a few minutes late, and the 4 of us had SUCH A great time watching the movie. Laughing and being loud and everything. LOVED the movie. Especially watching it with Friends! Amanda, if you read this, I'll TOTALLY go with you to see it again when you get back in town! hehe. I got home, and the kids were in bed, and Jake and Tom were getting ready to watch a movie. And the house was TRASHED. Kari and I had made plans to go on a 4 mile walk (still 93 degrees at 10pm...). We had to wait till the sun went down, because it's too intense otherwise. I changed my clothes, and left the boys with directions to get the house clean BEFORE I got back home. They were cleaning when I headed to the park to meet Kari. And we had a GREAT walk. We walked and sweated and chatted the whole way. I missed her this past week! We're gonna try and get together for a walk at night after the sun goes down more often! The boys had got the house cleaned, and were just turning on the movie when I walked in. I sat down with them to watch the movie and to blog. It's now almost midnight, and the movie is almost over. And I'm done blogging. Not sure what the day holds tomorrow. I've got to have Eme to Volleyball at 8am, and pick her up at noon. We may be going to the pool tomorrow with Kari. Not sure, though. We'll find out tomorrow, right? hehe. Sharon, this is SO cool. 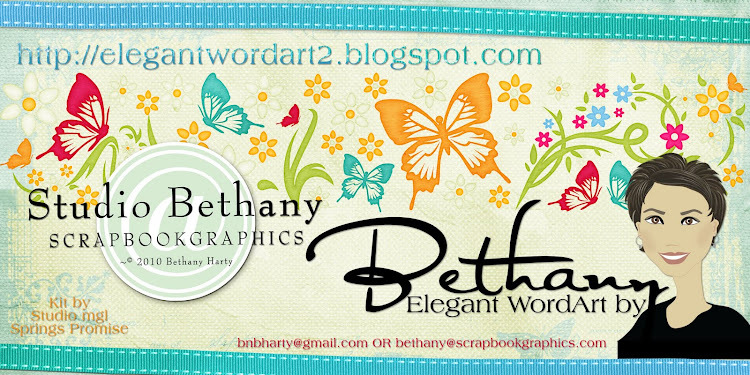 Those circles are awesome, and I like how the WordArt is a photograph mask! SO cool! Thank you so much for this post. 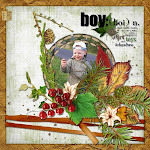 I want to let you know that I posted a link to your blog in CBH Digital Scrapbooking Freebies, under the Page 7 post on Jun. 28, 2011. Thanks again. You looked gorgeous for your night out, Bethany. I'm so glad you had a good time.